Pick Me! No, Pick Me! I decided to take a break from the reflections theme today when I saw these little monkey faces peering impishly up at me. 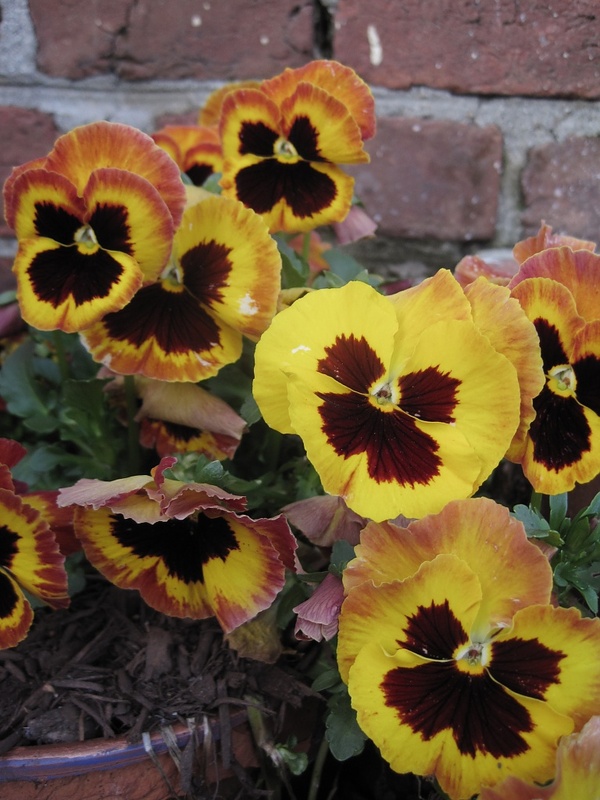 Who doesn't love a pansy? Their days are probably numbered here in Richmond as the daytime temperatures inch toward 80 degrees F, so this is my tribute to them and all the cold winter days they bravely kept the faith. Allison, the flowers are beautiful and I also like that we see some of the brick in the background. The colors on these flowers are amazing. Pretty! Don't you just love their little faces! It's a shame they don't last through the summer there! I love the colors against the brick; really nice photo! oh pick me indeed! so pretty! they are on the popular page!! The pansies are so pretty, I like pansies, too. I love pansies and you certainly have caught the colours well. LOL --- I told you to make note of your daffodil dates so we could compare! Believe it or not, this IS a seasonally-appropriate shot (for the Colorado mountains)!